There are few things more frustrating than dealing with traffic, construction, and road work. They all lead to road rage, anxiety, and elevated blood pressure. Leave it to Jeremy Scott to totally flip the script with that notion. 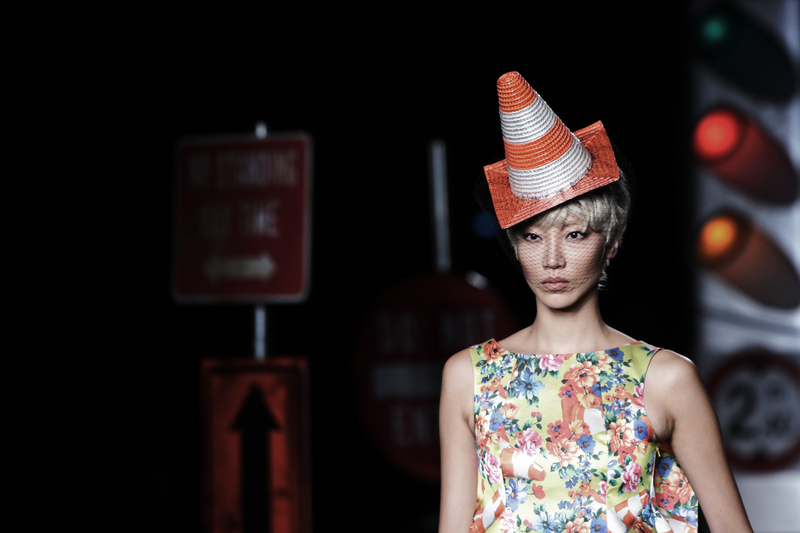 Moschino's Milan fashion show had a construction theme, with traffic cones repurposed into hats and headgear. The Powerpuff Girls, a fixture of the aughts, also factored into the looks! It looked like the ever-busy and ever-under-construction Manhattan, where there are always areas undergoing street fixes, inspired this runway presentation. A comic book aesthetic was also prevalent in the show. Scott and Moschino are always about bold pops of color, usually culling inspo from a variety of unexpected sources, like from McDonalds. But construction chic? That was the order of the day at the brand's showing in Milan. Here's what I love most about Moschino. The brand can take the stuff of ordinary life and literally fashion it into couture. Remember when Katy Perry carried a Moschino spray paint can to the 2015 Met Gala? Yes, her graffiti gown caused some controversy, but that's a whole other story. Vogue notes that attendees of the show were gifted not with hard hats but with Moschino-branded phone cases shaped like bottles of cleaner. How kitschy and cool! So, about that construction site-inspired runway? A mini traffic cone hat! How darling. It reminded me of a birthday hat, too. If it were black, it'd look like a witch's hat. Of course traffic signs were incorporated into the mix. Lunch boxes are another site fixture. This model and her ensemble were beautiful enough to stop traffic and grind it to a halt. Everything about these clothes was loud but playful. Note where the arrow is pointing! How naughty, Mr. Scott! A "Shop" sign? Love, love, love. This collection also had a graffiti feel, which is not new for Moschino. It's like graphic novel characters come to life. Dangerous couture indeed... but it's even better due to the pun-driven phrasing. There was a total super-heroine thing going on, too! This bodysuit was straight out of a Powerpuff Girls storyboard. Those little ladies ruled the early aughts and they are so back. Anyone else see the doe-eyed, fierce, Bettie Page-haired Buttercup from Powerpuff Girls? She's right there, amid all those colors and patterns. This collection mixes toughness and brightness with a sense of humor. It's not soft enough to be whimsical but it is certainly playful. Scott's point of view is always loud, bold, and in your face. But the runway show and the clothes did the near-impossible and that's make me look at traffic, which is a usual source of frustration, as something fun. Want more fun fashion? Check out the video below, and be sure to subscribe to Bustle’s YouTube page for more hacks and tricks!